From dandruff and dry scalp to skin conditions and product build-up, there are a variety of different scalp issues people regularly face. While there are treatments for specific conditions, it can be more effective to find an all-in-one solution, like Paul Mitchell Tea Tree Hair and Scalp Treatment. The scalp conditions we deal with have many causes. Everything from stress to changes in the weather can affect the health of our skin, hair, and scalp. Some people with underlying skin conditions, like seborrheic dermatitis, can experience outbreaks for different reasons. Finding a treatment option that works to soothe the symptoms of an itchy, inflamed scalp can leave you trying multiple solutions just to find one that works. The most important thing you can do to soothe these symptoms is to look at the ingredients of the treatment you’re using, and how they can help you find relief. 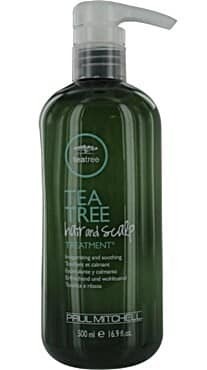 This article will provide a review of Paul Mitchell Tea Tree Hair and Scalp Treatment. As we hold the product against several categories, you will be able to determine if it’s the right option for you, and the problems you face with your scalp. Can I Expect Fast Results? 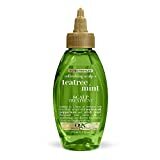 Is Paul Mitchell Tea Tree Hair & Scalp Treatment Right for Me? Certain scalp conditions are non-curable, like eczema and psoriasis. However, people learn to manage the symptoms through treatment solutions. Other scalp problems like dandruff, dry scalp, etc., can be easier to manage. Sometimes, problems with the skin on our scalp can even occur because of the products we use. Hair care products with certain chemicals and additives can build up on the scalp. They can either dry it out or cause it to become too oily. In these cases, using a different product to detoxify your scalp is often needed. If you regularly deal with any of these symptoms, the ingredients in the treatment solution can help. While this review is focusing mostly on the benefits toward the scalp, it can also help to treat dry, damaged hair. Additionally, lavender and peppermint oils are added to invigorate your hair and scalp and provide a naturally light and lovely scent. Tea tree oil is one of the most popular essential oils because it has so many practical uses. Many people use it with a carrier oil as a regular hair and scalp treatment. But, combined with the other ingredients in this formula, it can help to soothe painful and irritating symptoms even faster. It will also work to lock in moisture without allowing your scalp to become too greasy or oily. A buildup like that can do more harm than good. Unfortunately, many other standard products can cause such a problem. So, choosing a natural solution with such a potent essential oil provides that detoxification a scalp sometimes needs to be restored to health. Between the soothing properties of ingredients like tea tree oil and willow bark, and the healing effects of Vitamin E and soy protein, these combined ingredients can fight back against almost any irritating scalp condition. They are designed to alleviate symptoms almost immediately, and you should notice a difference after just one use. Want to Buy a Bottle? CLICK HERE to Order this Shampoo on Amazon.com! Because the main ingredients in this product are all-natural, side effects are rare. If you have allergies to any of the ingredients, use caution before applying it to your hair/scalp. Certain ingredients and allergens can sometimes make skin conditions worse for some people. So, it’s important to know what won’t cause your skin to react. Always use the product as directed on the bottle for best results. If you do experience any irritation after regular use, stop using it immediately, and talk to your dermatologist about other possible options. You should keep the product away from your eyes at all times. If it does get into your eyes, rinse immediately with water. If irritation continues, contact your doctor immediately. Do not let children use this product unless they are being supervised. Some products can be damaging to people with color-treated hair. The ingredients in this formula are gentle enough for all types of hair, including dyed. It won’t strip your hair of any color and can make color-treated hair look softer and healthier. Whether you have thick or fine hair, it will work the same. It also works on all different ethnic hair types to strengthen and hydrate hair, and soothe an irritated, itchy scalp. The main focus of the product should be alleviating any symptoms of a skin condition on the scalp. The good news is that you don’t have to sacrifice the overall health and appearance of your hair by treating your scalp with it. It’s important to note that this product doesn’t replace your traditional shampoo. It isn’t used as a washing agent. Rather, it’s designed to supplement your usual conditioner, and you can use it several times a week as a treatment option. It’s not something you need to use every single day to see results. Because you can easily include it as a part of your normal hair care routine, even in the shower, there are no real additional steps you have to worry about to make sure the product works. It’s very easy to use, and because you don’t have to use it every day to see results, it’s extremely convenient. Some treatments can require daily use, or even application multiple times a day. The ingredients here are so effective, just a couple times a week can provide you with relief from your symptoms. Because of the powerful combination of natural ingredients, positive results should come very quickly. Ingredients like tea tree oil and willow bark can help to soothe even the most inflamed skin. While it may take some time for additional symptoms to subside, finding instant relief is typically what most people are looking for in a product like this. Keep in mind that the peppermint oil included in the formula isn’t just to make the treatment smell great. Peppermint provides a natural cooling sensation. If you’ve ever had a scrape, cut, or an inflamed area elsewhere on the body, you know that applying a mentholated solution can help to ease the pain immediately. The peppermint in this treatment offers the same effect. What’s so important about ingredients that keep itching at bay? They can help to prevent the condition from getting worse. When you struggle with anything from dandruff to eczema, you can form irritating, itchy patches all over the scalp. The urge to scratch at those patches can become almost unbearable. Unfortunately, scratching can potentially lead to bleeding, which can open up your skin for infection. Finding a solution that helps to soothe the urge to itch immediately is a huge benefit. When you purchase this Paul Mitchell product, you’re getting a salon-quality treatment solution at home. If you’ve ever purchased a product directly from a salon, you know how pricey they can be. This 6.8-ounce solution is much less expensive than almost any similar product you could find in a salon. When compared to other over-the-counter scalp treatment options, it still holds its value. One of the biggest advantages of this product is that you don’t have to use it every day to see results. Additionally, you only need to use about a quarter-sized amount during each use. Because of that, it will last much longer than products that require daily use in larger amounts. Some people have claimed their salon uses this product after an intense hair treatment, to ensure the scalp and hair stay healthy. If hair experts are using it with confidence, there is no doubt the value of using it at home is high. Shampoo and rinse hair normally, in warm water. Grab Tea Tree Hair & Scalp Treatment in place of traditional conditioner twice a week. Apply a small amount to your hands. Massage gently into hair and all over the scalp. Be careful not to massage too hard or accidentally scratch scalp. Continue to rub onto scalp for 3-5 minutes. Due to natural ingredients and a fast-acting formula, there are things to love about this product. However, it’s important to know if it will work on your particular scalp condition, and what other drawbacks there may be. Below, you’ll find a list of advantages and disadvantages, based on what others are saying about this particular treatment solution. It works on a variety of different scalp conditions. In addition to scalp health, it leaves hair shiny and healthy. The product focuses on natural key ingredients. Daily use isn’t required to see fast results. Unlike many other treatment products, it leaves a pleasant smell. If you have extremely sensitive skin, some of the ingredients may dry it out or cause a burning sensation. May not be strong enough for severe cases of scalp psoriasis or eczema. If a skin condition on your scalp is causing you discomfort, you should talk with a dermatologist. They will be able to tell you which ingredients will work best for your case. Overall, however, complaints and problems with this treatment by Paul Mitchell are few and far between. This scalp treatment has so many benefits. In addition to using natural ingredients to soothe an irritated scalp, the salon-grade company has ensured this product is gluten-free, vegan, and paraben-free. It will not strip your hair or scalp of any natural oils, color, or nutrients. No matter what skin condition you’re dealing with on your scalp, this is an all-in-one solution that can help with just about any of them. From mild dandruff to severe itching, finding relief is ideal for those dealing with irritation. With just one use, you’ll notice the specialized formula going to work and soothing your discomfort. We hope this review has been beneficial for you. With so many scalp treatment options on the market, it can be difficult to make a decision when it comes to the best one. This product receives extremely high ratings based on our categories, as one of the best ways to treat an irritated scalp, and to enjoy healthy hair. You can even use it to maintain a healthy scalp once your irritation is gone. It’s powerful enough to soothe severe irritation but gentle enough for regular use. Want to Know More? CLICK HERE to Read More Customer Reviews and FAQs!